Lens Description: ts contrast and detail rendition even at full aperture set new standards among wide-angle lenses. Stopping down by just 1 to 1.5 stops delivers maximum optical performance across the entire image field.The high levels of brilliance and plasticity are retained even in close-up photography. 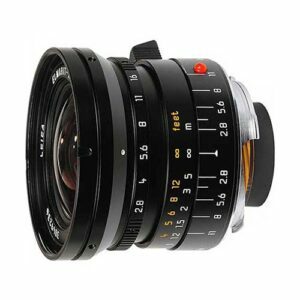 This lens is ideal for photojournalism assignments and architectural shots. The 24 mm focal length means that converging verticals, such as those encountered when shooting buildings, are easy to master with this lens without having to work from too great a distance. Though its focal length is only 3 mm longer than that of a 21 mm lens, the 24mm yields surprisingly natural perspectives with no indication that a super-wide-angle lens has been used.